A recent paper from Amyris Biotechnologies reports optimization of this pathway for industrial production to yield 40 g/L of amorpha-4,11-diene along with a chemical process that completes the production of semi-synthetic artemisinin. The first step was to increase flux through the pathway by tuning gene expression. While previous strains had only overexpressed HMG-CoA reductase from the mevalonate pathway that leads to the amorpha-4,11-diene precursor farnesyl pyrophosphate, the researchers at Amyris elected to construct new strains that instead overexpress every gene leading to farnesyl pyrophosphate by placing them under strong, galactose-regulated promoters. Because expression of HMG-CoA reductase (tHMG1 in the above figure), which catalyzes the first committed step in the pathway, had previously been shown to be limiting, they also added two additional copies of the gene. These adjustments in gene expression led to a fivefold increase in amorpha-4,11-diene production. Low yields are not the only limiting factor for commercialization of pathways from academic labs. Some of the strategies that are often used during initial pathway construction to allow high-level production of foreign proteins in microbial hosts add extra expense and complexity that is undesirable for economical large-scale production. One such problem that Amyris needed to overcome was that the original pathway was set up such that the presence of galactose was required for expression of the pathway genes. The galactose-requiring expression system adds a specific DNA sequence in front of foreign genes that is normally found in front of the genes required for yeast to grow on galactose. This sequence is recognized by a DNA-binding protein, Gal4, which also binds to some of the cellular machinery needed for transcription, ultimately leading to high levels of protein production. In the absence of galactose, a galactose-sensing protein, Gal80, binds to Gal4, blocking its interaction with the transcription machinery and shutting down protein production. This system is popular in metabolic engineering because it provides a convenient way to trick yeast into expressing any protein you want by co-opting the DNA sequence that controls expression of galactose breakdown genes. The drawback, however, is it requires the use of galactose as a carbon source, and that’s too expensive to be used in industrial-scale fermentations, even when yields are higher. To get around the need to use galactose as a carbon feedstock while still taking advantage of the high levels of gene expression that Gal4 can promote, the scientists at Amyris deleted Gal80, the protein that blocks interaction of Gal4 with the transcription machinery in the absence of galactose. Without Gal80 to interfere with transcription, HMG-CoA reductase and amorphadiene synthase are expressed at high levels regardless of the carbon source. This modification produced a yeast strain that made amorpha-4,11-diene at similar levels to the original, but using glucose, which is cheap enough for large-scale applications, as a carbon source. Fermentation conditions were then optimized for this strain. To direct carbon flux away from biomass accumulation (i.e., cell growth) and toward synthesis of amorpha-4,11-diene, phosphate levels in the yeast media were limited, increasing titers to 5.5 g/L. Based on the ability of yeast to convert ethanol to acetyl-CoA, the yeast were fed with mixtures of ethanol and glucose in an attempt to increase the cytosolic concentration of acetyl-CoA. This indeed increased yields significantly, to 16.5 g/L. Even better results were obtained by feeding with pure ethanol, which increased yields to the reported 40 g/L, corresponding to an impressive 20% yield from carbon. Finally, to bridge the gap between amorpha-4,11-diene and artemisinin, they developed a synthetic strategy to convert amorpha-4,11-diene to dihydroartemisinic acid, the precursor of artemisinin. Use of 9-borabicyclo[3.3.1]nonane (9-BBN) allowed selective hydroboration of the exocyclic double bond, giving dihydroartemisinic alcohol as an 85:15 mixture of epimers, with the desired epimer making up the bigger portion of the mixture. The researchers opted for a two-step oxidation to make the carboxylic acid, avoiding the use of toxic chromium-based oxidants and undesired reactivity of the double bond. Dihydroartemisinic alcohol was therefore oxidized to dihydroartemisinic aldehyde with sulfur trioxide-pyridine, and the aldehyde was taken to the acid with sodium chlorite in DMSO to give dihydroartemisinic acid in 48% overall yield from amorpha-4,11-diene. Luckily, the step that looks the most difficult to achieve synthetically, conversion of dihydroartemisinic acid to artemisinin, is believed to occur non-enzymatically in nature, requiring only molecular oxygen and light, so it seems very feasible to produce artemisinin itself using this synthesis, although, disappointingly, this was not explored in the paper. It will be exciting to see how the pathway is completed for industrial production. As Courtney pointed out in his post on microbial butanediol production, a lot of papers from academic labs on microbial chemical production seem too low-yielding to ever be commercialized. This paper provides a great example in which what started out as a low-yielding pathway is now poised to change the way an important pharmaceutical is produced. The first doses of semi-synthetic artemisinin, which presumably will be produced by a pathway similar to the one developed in this paper, are slated to become available later this year through a partnership between Amyris, The Institute for OneWorld Health, and Sanofi-Aventis. In addition to addressing a public health concern and providing a platform for greener production of artemisinin, the yeast strains and methods developed in this paper may also have an impact on the production of many other chemicals. Only the final enzymatic step is specific to production of amorpha-4,11-diene, so it’s possible that the same yeast strain could easily be engineered for production of other terpene-derived molecules like flavors, fragrances, and advanced biofuels. By tmckeagberkeleyedu in Engineering, Synthesis on April 8, 2012 . Why do you think they decided to stop at amorphadiene, and not go all the way to dihydroartemisinic acid, like they did in their 2006 Nature paper? Presumably the production levels were much lower, but is it clear why? Great question! They actually did do some initial optimization of production of artemisinic acid by expressing amorphadiene oxidase (AMO) and a cytochrome P450 reductase as in the 2006 Nature paper. 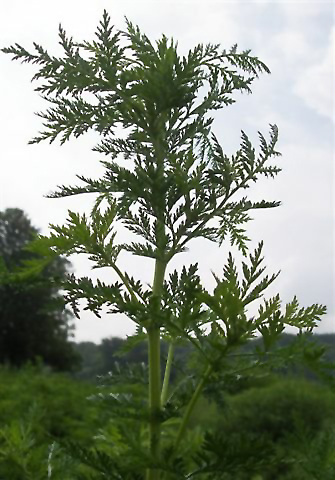 When they overexpressed the mevalonate pathway genes, the resulting strain made ten times more amorpha-4,11-diene than artemisinic acid even though AMO was also being expressed at a high level, so they abandoned it at that stage. Some previous work done in the Keasling lab had also shown that production of artemisinic acid in yeast leads to poor plasmid stability (meaning a lot of the yeast spontaneously lose the plasmid and are no longer expressing the foreign genes) and also causes induction of drug-resistance and osmotic stress genes, both of which are signs of toxicity. In a control strain, they made an inactive mutant of AMO and all of those effects went away, linking them directly to the enzyme activity or accumulation of artemisinic acid. I think the lower titers in combination with the known toxicity probably led them to give up on artemisinic acid production since there would have been a number of problems to correct in order to get high yields.